There is a direct relationship between building equipment maintenance and building energy efficiency. Dirt, heat, corrosion and lack of lubrication, over time make HVAC and electrical equipment work harder. That uses more energy and increases operating and maintenance costs. Buildings often contain hundreds of pieces of equipment that require maintenance, but preventative maintenance budgets are usually very limited. It is easy to (unintentionally or intentionally) miss recommended service on individual equipment. And if the work is done, equipment serviced under the PM contract often will not be specifically identified in service records by the field technician. The industry practice of competitive bidding for preventative maintenance contracts further minimizes the available budget to actually complete PM work, leaving contractors to generate profits from the inevitable repairs they “uncover” while onsite. Technicians are incented to find repairs, not prevent them. Progressive facilities managers use computerized maintenance management systems (CMMS) to maintain equipment records, but these are “out-of-process” with field operations and their service providers. This means that service records will be updated after the fact, and may require manual intervention. Inaccurate or inadequate information from the field and the administrative cost of the process may outweigh the value of collecting service records at all. Building owners are pressured by stakeholders to reduce energy consumption and operating costs across their building portfolios. Without robust service records and an efficient management process they lack the ability to measure maintenance processes. Lacking critical baseline measures then have no financial basis for change. BuiltSpace is fundamentally changing service management processes to eliminate these barriers to energy and operational efficiency. This starts with service processes which electronically record service transactions, at the equipment, in real-time, for work done by either in-house or external service providers. 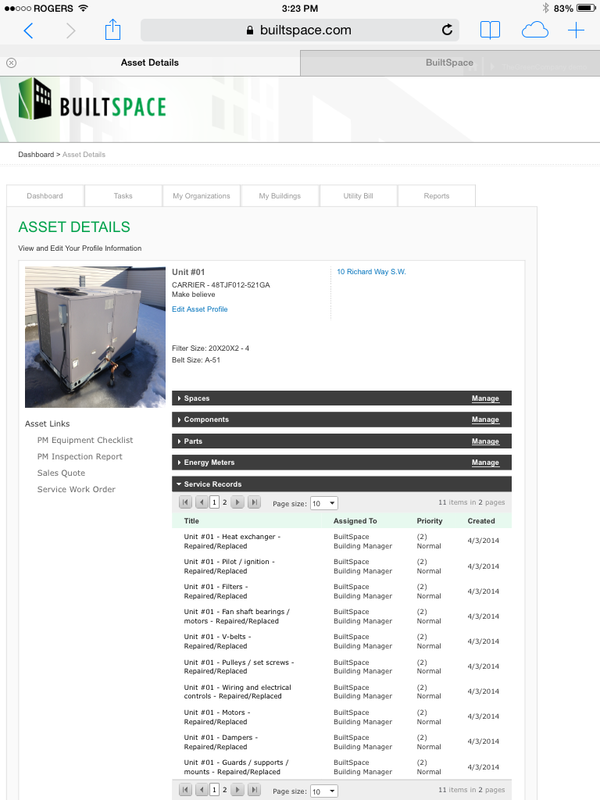 Asset and service records for each piece of equipment are shared with stakeholders, and accessed on site by our universal asset tag. The BuiltSpace collaborative services delivery platform allows service providers to work with building owners, in order create and implement a least cost operations and maintenance plan, with measurable performance indicators. Key to success of this plan are accurate and complete equipment service records. « You Can’t Email Knowledge: Transforming Your Mechanical Sevices Practices.